On and around our property this year was the eruption of the 17-year cicada. We moved here 18 years ago, so we would have been here the last time they erupted. But it was our first year here and the time of their eruption was also the time of the birth of my twins. I don’t have any recollection of the cicadas. 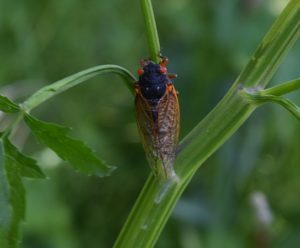 This June we knew the cicadas were here by seeing the hard locusts shells on trees and clothes lines and items sitting near trees. About a week later we started hearing a background hum or buzz. The Farmer described it as an other-worldly noise. (Think outer space other-worldly.) If we were in the city and coming home, there was no buzz up on LaFayette Rd. But as we came to Graham Road, the buzz started and continued until we got to our home (and probably beyond). I think the noise was temperature dependent and perhaps daylight dependent as well. It would start around 9-10 a.m and stop around 4-5 p.m. This continued for about 2 weeks. We were able to record the noise of the cicadas. At first you will hear the hum of the cicadas. Then at about 10 sec. you hear the hum of 1 cicada. From our internet and book research, we found that only the males make the noise. Every so often we raise what we term a “naughty” cow. 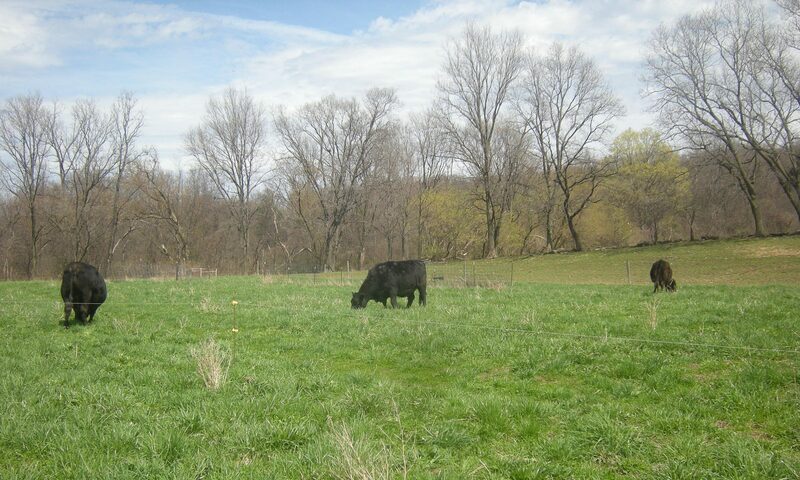 And our naughty cow recently went on a field trip to our neighbor’s house. A naughty cow often develops when the calf is out with Mom, and she is in a non-electrified fence. The curious calf naturally wanders to and then through the fence. The calf never learns that fences exist as boundary markers. Most of our calves eventually learn what a fence is, but need one hot wire to remind them. Naughty cows only respect fences with multiple strands of electrified wire. Generally speaking though, cows are quite content to lounge in the area they are given. Sure, the grass is always greener elsewhere, but as long as they are not super-hungry, they will not cross a fence line to get it. We currently have a naughty cow, and it changes the pasturing dynamic.